While his story is intimately connected to his family life and life as a Navy SEAL, Shea’s memoir offers a message that is universally resonant. 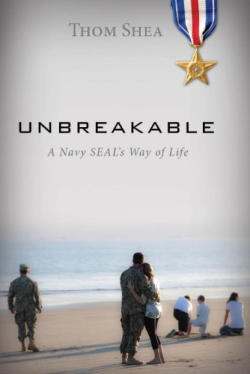 Senior Chief Thom Shea’s Unbreakable: A Navy SEAL’s Way of Life offers an extraordinary and intimate expedition into a realm known by precious few. However, Shea’s overall message—“Your Internal Dialogue, what you tell yourselves every conscious moment, is the source of power when properly controlled, but also the source of weakness if you lose control”—is universally resonant. While on the transport aircraft, Shea reflects on the effect of leaders, both good and bad, and considers the men in his unit. The dialogue between the men is lively throughout and reads honestly, animating the book’s compelling and thought-provoking content. Though thematically relatable, the targeted audience is vague. Written as a legacy to his children, the language and sexual references seem inappropriate at times. Stacy, Shea’s “Spartan Wife,” who actually insisted Shea put his experiences to paper, wrote not only the preface but also other sections of the book, in an epistolary exchange between her and her husband. The format lends itself to intimacy overall—a father’s words to his children, the private exchange between husband and wife—but Shea’s larger message of discovering one’s Internal Dialogue is delivered like a motivational speech to a large and anonymous audience. Shea is a sympathetic narrator; often comical when describing sobering realities, such as the exhaustion that comes from sleep deprivation and the failure to get comfortable despite the maneuvers Shea coined “disturbed yoga.” However, some passages undermine the narrator’s character, established as a loving, hardworking father, husband, and leader dedicated to the safety of his men and his family. The contradiction results primarily from Shea’s portrayal of the enemy. In one instance, while clearing a building, Shea and his unit uncover an elderly man and violently fling him out of hiding and against a wall: “Apparently, he was barely alive … When the interpreter arrived, we found out he was ninety-eight years old, and had not eaten or had water in three days.” Although undeniably authentic to the reality of war, the inclusion of such anecdotes challenge the paternal intentions Shea stated for writing his narrative. Shea writes candidly about the challenges facing not only a Navy SEAL but also those confronting his family before, during, and after deployment. Unbreakable is a good read for anyone in the military.